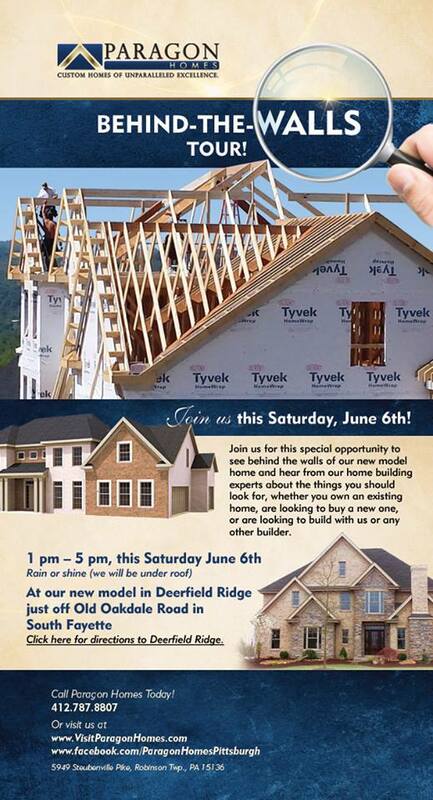 This Saturday: Paragon Home Presents A “Behind-the-Walls” Tour at Deerfield Ridge in South Fayette. Join us for this special opportunity to learn more, rain or shine, from 1pm-5pm EST on June 6th, 2015. 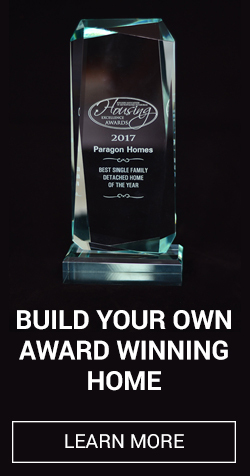 Consistently recognized as one of Pittsburgh’s premier custom home builders, it is Paragon’s goal to turn your dream into a reality through planning, attention to detail and outstanding customer service. Deerfield Ridge sits just down the road from the South Fayette school campus with a view that has to be seen to be appreciated. Since 1987 Paragon Homes has been building custom homes of the highest quality all across Pittsburgh with a focus on attention to detail and providing clients with a smooth building process. 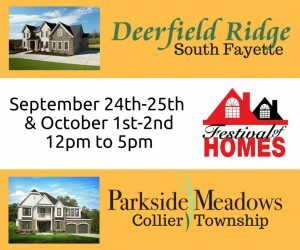 Paragon Homes is proud to welcome you to their newly-decorated model home this Saturday and Sunday, June 21st & 22nd, 2014, from 1 p.m. to 4 p.m. EST, at Deerfield Ridge in South Fayette Township. The model home is designed to appeal to the needs of today’s home buyers, with features like a spacious kitchen that opens to the great room, where there is plenty of space for friends and family to gather. You will notice the difference at the front door…and it’s absolutley amazing! Upgraded trim carpentry and hardwoods serve as examples of the old world craftsmanship still found in Paragon’s new homes. Also included are: a three car garage, an 88 by 105 foot flat backyard, main-level laundry, and a study/flex room to adapt to your needs. If you could see behind the walls, you would notice the type of solid framing that puts a premium on withstanding the test of time, plus insulation and other efficient features that exceed the ENERGYSTAR requirements. Our attention to detail is unmistakable, and lets you know that it’s a Paragon custom home. Overall, Deerfield Ridge features luxurious, custom-built homes that range from $405,000 to over $900,000, and come with already-included options, for which other builders will charge extra. 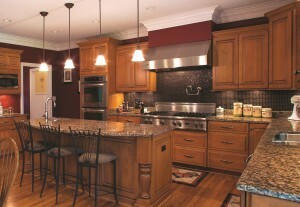 Homes in Deerfield are uniquely designed for each client, and never look exactly the same as your neighbors’ homes. You can use a home design suggested by the Paragon team, bring in your own plans or ideas to use as a starting point, or start fresh with their architects to design a home from the ground up. 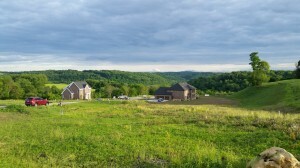 Deerfield’s picturesque cul-de-sac offers incredible views of rolling hills surrounding the spacious lots, and is located only minutes from the new school buildings of South Fayette, one of Pittsburgh’s most-sought-after school districts. Building with Paragon Homes is designed to be an easy and enjoyable experience that puts your needs first. We’ve put a lot of thought into mindfully creating a buyer-friendly process that provides a true custom home, while still being uncomplicated and cost-effective for our customers. Paragon homeowners can make any custom changes to their home that you desire and may choose selections from any brand (not just the builder’s favorites,) all with the personalized attention to detail and customer service that only a builder of our size can provide. Paragon clients are free to select from many banks and lenders to ensure that you get the best loan for your hard-earned money. This means that buyers can save $20,000 or more in closing costs … not to mention getting the best rate and the fact that most clients don’t need to sell their current home to begin construction. Ashley Boynes-Shuck is a well-known blogger, author, and social media pro from Pittsburgh, PA. She was voted Best Blogger in Pittsburgh and Who to Follow on Twitter 2010, one of Pittsburgh’s Top 40 Under 40 for 2011, a 2012 Woman of the Year and Athena Young Professional awards candidate, one of Pittsburgh’s Most Influential Twitter Users by the Pittsburgh Business Times, and happily lives in a suburb of Pittsburgh with her husband, pug, doberman, frogs, and cats! In her free time she focuses on advocacy and volunteer work, as well as rooting on the Pittsburgh Steelers!